BACKGROUND: Since 1994, higher education policy has been committed to equity of access for all, irrespective of race and gender. OBJECTIVES: We investigated progress towards these goals in the education of medical doctors, with an emphasis on gender. METHODS: Databases from the Department of Education (DoE), Health Professions Council of South Africa (HPCSA) and University of Cape Town (UCT) Faculty of Health Sciences were used to explore undergraduate (MB ChB) trends at all eight medical schools and postgraduate (MMed) trends at UCT. RESULTS: Nationally women have outnumbered men in MBChB enrolments since 2000, figures ranging between 52% and 63% at seven of the eight medical schools in 2005. However, the rate of change in the medical profession lags behind and it will take more than two decades for female doctors to outnumber male doctors. A study of UCT postgraduate enrolments shows that females had increased to 42% of MMed enrolments in 2005. However, female postgraduate students were concentrated in disciplines such as paediatrics and psychiatry and comprised no more than 11% of enrolments in the surgical disciplines between 1999 and 2005. CONCLUSIONS: The study provides a basic quantitative overview of the changing profile of medical enrolments and raises questions about the career choices of women after they graduate and the social factors influencing these choices. In line with post-1994 transformation policies, previously white medical schools made efforts to change the race and gender profile of their students. For some this began before 1994 but accelerated thereafter. Six years later women outnumbered men at undergraduate level at all but one university, but racial equity had not been achieved and the rate of change in the profession was slow. We explored the changing gender profile of undergraduates and focused on postgraduate enrolments at the University of Cape Town (UCT). The South African medical profession remains predominantly male, but this is changing. Registered female medical practitioners increased by 24% in the period 2002 - 2006, compared with 6% for male doctors and 11% overall (Table I). The proportion of female doctors increased from 27% to 30% during that period. However, at the current rate of growth of female numbers (5.6% over the 4 years, compared with 1.5% for males) it will take about 22 years for female doctors to outnumber male doctors. This paper excludes medical students who trained in Cuba in terms of a government-to-government agreement of 1996. By July 2007 470 South Africans had enrolled in this programme, of whom 91 had qualified.4 A detailed breakdown of these figures was not available. In the 7-year period 1999 - 2005, enrolments at the eight medical schools increased by 17% for females whereas enrolments of males declined by 10%. White male enrolments dropped by 30%, Indian male enrolments by 40%, and coloured male enrolments by 2%. In the case of coloured males the decline was not consistent as their numbers increased in some years and dropped particularly low in others. Black male enrolments increased steadily by 28%. White and Indian female enrolments dropped by 12% and 7% respectively, while coloured female enrolments almost doubled and black female enrolments increased by nearly two-thirds (Table II). Black enrolments (male and female) increased from 33% to 45% of total enrolments and coloured enrolments increased from 6% to 8%, while Indian enrolments dropped from 20% to 15% and white enrolments from 41% to 32%. White females comprised the largest group in the 1999 cohort (22%), but had decreased to 19% by 2005. 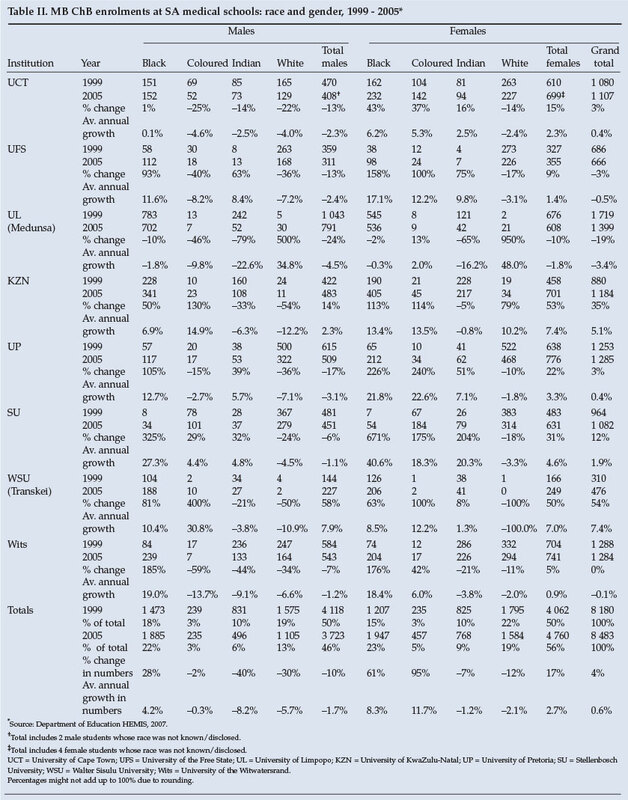 Black females increased from 15% to 23%, forming the largest group in 2005, followed by black males (from 18% to 22%). The University of Limpopo (UL) (previously Medunsa) was the only university to have a higher proportion of males than females, although by 2005 their proportion had dropped to 57% from 61% in 1999. UCT had the highest proportion of females in 1999 (56%) and this increased to 63% in 2005. The largest percentage increases were for whites at UL, but the numbers were low: white females increased 10-fold from 2 to 21 from 1999 to 2005 and white males 6-fold from 5 to 30. At the University of KwaZulu-Natal (UKZN), another historically black university (HBU), white females nearly doubled (from 19 to 34). At the third HBU (Walter Sisulu University (WSU), previously University of Transkei) numbers of whites dropped from 4 to 2 (white males) and from 1 to 0 (white females). The next largest increases were for black students at the historically white Afrikaans universities. Stellenbosch University (SU) increased its black female students 7-fold from 7 to 54 and its male students from 8 to 34. The University of Pretoria (UP) doubled its black males from 57 to 117 and more than tripled the numbers of black females from 65 to 212. The University of the Free State (UFS) nearly doubled its numbers of black males from 58 to 112 and nearly tripled its black female numbers from 38 to 98. Nonetheless, the proportions of these groups remained low and at these universities white females remained the largest single grouping. Proportions of black students increased at all the universities, while proportions of whites dropped. However, blacks remained in the majority at the historically black medical schools (UL, KZN and WSU, where they formed 88%, 63% and 83% of enrolments, respectively). Whites remained the majority grouping in all the historically white schools bar UCT, where the proportion of blacks in 2005, at 35%, was 3% higher than that of whites. SU had the highest proportion of coloured students (26%) in 2005 and the University of the Witwatersrand (Wits) the highest proportion of Indians (28%). While there is a higher proportion of female MB ChB students than women in the country as a whole (56% compared with 52% in 2005), the proportion of black students remains unrepresentative. According to the 2001 Census, South Africa was approximately 79% black, 8.9% coloured, 2.5% Indian and 9.6% white.5 In contrast, the 2005 cohort of medical undergraduates was 45% black, 8% coloured, 15% Indian and 32% white. Nonetheless, there have been rapid advances towards equity considering the legacy of apartheid education and the racial breakdown of matric results, where Indian and white candidates outperform black and coloured candidates. Figures for 2006 from the DoE show that only 12% of the black candidates and 17% of the coloured candidates passed the Senior Certificate examination with the minimum requirement to enter a university, compared with 55% of the Indian and 53% of the white candidates. Blacks comprised 83% of the candidates but only 77% of those who passed and only 59% of those who passed with endorsement. Whites formed 8% of the total who wrote, 12% of the total who passed and 26% of the total who passed with endorsement. However, blacks continue to form the greatest number of matriculants with endorsement. The 59% translates into 51 070 students out of 86 164, a proportion that is still not reflected in the medical school enrolments because many of these matriculants have not met the further academic criteria for entrance imposed by medical schools, which generally receive many more applications than they can admit. These additional criteria include high grades in mathematics and science and performance in additional placement tests. For this reason some universities have introduced differential criteria for different population groups (with lower academic criteria for blacks and coloureds) as well as academic support programmes in an attempt to ensure access for the most historically disadvantaged groups. At UCT medical school we found that proportions of postgraduate women students were far lower than at undergraduate level, but their numbers were increasing rapidly thanks to a transformation programme. Between 1999 and 2005 women students increased from 28% to 42% of MMed enrolments and male students declined from 73% to 58%. Black male MMed enrolments increased by 43% (from 37 to 53 students, although they peaked at 61 in 2002). Black females increased steadily from 9 to 34 (278%). There were the same number of coloured males in 2005 as in 1999 (17), but the numbers fluctuated from year to year with a peak of 26 in 2000. Coloured females increased from 9 to 19 (111%). Indian males decreased from 31 to 27 (13%) while Indian females increased by 80% from 10 to 18. White males dropped 37% from 227 to 143 and white females increased by 11% from 91 to 101. Overall student numbers also dropped - from a total of 431 in 1999 to 415 in 2005 (a decrease of 4%). Although female numbers at MMed level increased by nearly 50% in the 7-year period 1999 - 2005, this was not spread evenly in the 28 specialist disciplines. In 1999 the top choices for women MMed students were psychiatry and paediatrics (18 each), anaesthesiology and medicine (13 each) and obstetrics and gynaecology (12). These disciplines together accounted for 62% of the total female enrolments at MMed level. In 2005, there were a greater number of women doing postgraduate study and they were also spread more widely. Nonetheless, the top five choices still included paediatrics (23), anaesthesiology (22), obstetrics and gynaecology (21) and psychiatry (21). Public health was the fifth most popular choice (13). These five disciplines accounted for 57% of the total female enrolments. Significantly, surgery drew very few female students during the 7-year period. Declining interest in surgery as a specialty in general,6-8 and low numbers of female surgical students in particular,1,9,10 are international phenomena, and UCT is no exception. Enrolments in the surgical disciplines (cardiothoracic surgery, neurosurgery, orthopaedic surgery, plastic surgery and general surgery) declined from 101 in 1999 to 80 in 2005, falling as low as 73 in 2003. Women formed no more than 11% of enrolments in any of the 7 years reviewed, and some surgical disciplines had no women students. The greatest number of female enrolments was in 1999, when 11 out of a total of 101 surgical enrolments were women. In other years, female students have ranged from 3 to 6 per year (4 - 8%). White males have dominated the surgical disciplines, followed by black males and white women. There were no black or Indian women in any of the surgical disciplines between 1999 and 2005, and in no year was there more than 1 coloured woman. The literature indicates that the traditional gender hierarchy that characterised medicine is still felt acutely in the operating theatre.12-18 Female surgeons complain of experiencing exclusion from unofficial male networks and sometimes outright hostility, while female nurses show them less respect. The lack of female mentors and role models, the shortage of part-time specialisation posts and locums for maternity leave and the long, unsociable working hours are other important factors deterring women from becoming surgeons. These obstacles are particularly unfortunate because women are considered to have a number of attributes that make them particularly suited for surgery, including communication skills, ability to multi-task and gentler tissue handling. Furthermore many women prefer to be treated by female doctors, particularly for illnesses related to women's health. It is widely recognised that women play an invaluable role in the medical profession. Among many other advantages, they are more likely to adopt a patient-centred approach and to practise in the public service, in primary care and among the poor. However, where they continue to bear the brunt of child care they are forced to make decisions that can cause imbalances in the profession. The medical profession traditionally demands that doctors should work inordinately long hours, including considerable overtime. Men have managed to do this because of background support from their wives. But many woman doctors do not have much support and society still expects them to take primary responsibility for the care of their children. In the UK many woman doctors choose to work part-time, if they specialise at all it is in fields that offer convenient working hours, and even if they do work full-time they tend to avoid involvement in professional activities (e.g. serving on professional committees). South Africa has been warned for nearly three decades that it must be made easier for women to work and specialise.19-20 Our statistics suggest that women still experience obstacles in some fields, and we need to know more about them. Department of Education (DoE) Higher Educational Management Information System, 1999 to 2005. 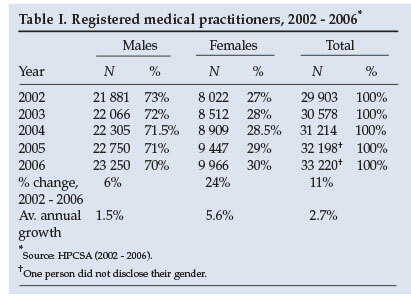 Health Professions Council of South Africa, Register of Medical Practitioners, 2002 to 2006. University of Cape Town Faculty of Health Sciences, MMed enrolments, 1999 to 2005.